Full moon on the Southern Gaia’s Hemisphere came expectedly yet surprisingly different. She met Him in full force, face to face, keeping us, mortals, speechless, causing a mini Universal Chaos within the elements. So exciting was their pre-meditated and long awaited Cosmic dynamic Relief. Both a black cat and a black dog crossed my path this morning, reminding me to “remember” to stay awake and exchange with the souls I meet. You must have heard of Parthenon (Ancient Greek: Παρθενών), a temple on the Athenian Acropolis dedicated to the goddess Athena built around 440 BC. 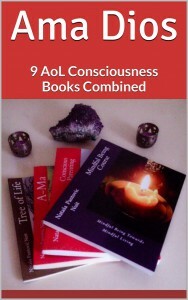 Launch of Ama Dios: 9 AoL Consciousness Books Combined. Mind chitta is an astral vibratory response within the subconscious layers with the precise words, feelings, and thoughts formations. We all enter it unconsciously. An ancient Indian Philosopher Patanjali recognizes these dynamics within his Yoga Sutras. The Ancient Greeks Mythology and Philosophy Mother of All Sciences resonate with exactly the same logic. The infinite divisibility of the atom with its rapid transformation prevents the Soul from manifesting. Two atoms react uniquely different when with each other and two Souls have uniquely different encounters. Two mothers exchange parenting knowledge, two grandpas share their illnesses; two lovers interact through a sexual contact. The circumstances dance within the Universal Flow, creating a type of Dough that subconsciously modifies our thinking principle as a Soul materialized on Earth or someone who belongs to a Group. 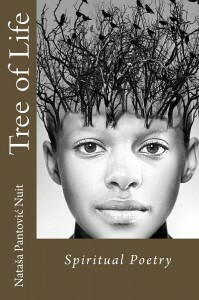 Tree of Life with Spiritual Poetry by Nataša Pantović Nuit, Alchemy of Love Mindfulness Training #9, Year: 2017, Publisher: Artof4elements. Paperback: 256 pages. Size: 6"x9". Tree of Life in various interpretations, within myths, and as a mystical concept represents the interconnectedness of all life on our beautiful planet. The book starts with an invitation to a Tantric Ball within the Field of Dreams. It is a journey of many true life stories interwoven into a question: What is our soul’s yearning, and do we live it authentically living our Highest Potential as Human Beings? We journey through Scotland, and visit Findhorn, a spiritual group that during the last 40 years experiments with more enlightened community living. We travel from Serbia to Cambridge to Maltese temples, from Nairobi to Addis Abeba in Ethiopia. Visit Lamu in Kenya that full of rich drug addicts, and find out why Nuit chose to define the humanity’s strongest limiting belief as: “We need suffering to grow.” What happens when your country collapses, when you stay without your soul-mate and when your soul’s quest is against your life path! How to listen to inner messages that at times feel completely irrational? The Mindfulness Training Series of 9 fiction and non-fiction books by 7 authors focusing on spiritual growth, creativity and mindfulness. 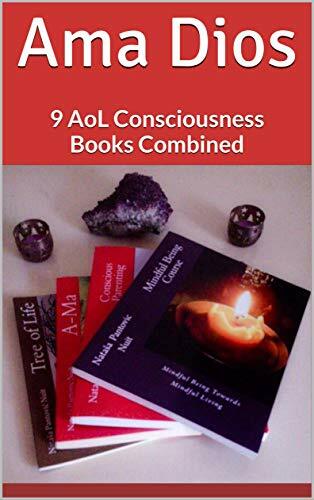 The series of many genre's, including poetry, personal development, historical fiction, the world of AoL explores numerous self development themes. I was surprised to see the same Leda in Leonardo’s Immaculate Conception as a mystical metaphor for Mary. Honey bees, super sisters’ bees and their Eusociality has developed over the 1,000s of years of evolution and has always fascinated people with its efficiency and complexities. In haplodiploid species, bees included, females develop from fertilized eggs and males from unfertilized ones. A queen only mates during one brief period in her early life, over the course of a small number of mating flights. About 10-20 drones (males) will mate with the queen during her mating flights. For all of you special Consciousness Researchers, we have a great news! If you are lucky to read this message during the offer, you will be able to download some of AoL Books and Courses for FREE. Follow the above links for FREE books downloads and enjoy this amazing time! <3 Do leave a Review or two in return!